After leaving her home in the western Canadian fishing village of Tofino to spend the summer in Alaska studying humpback whales Kitty finds herself caught up in an unforgettable adventure involving stolen gold, devious criminals, ghostly shipwrecks, and bone-chilling curses. Kitty's adventure begins with the lingering mystery of a sunken ship called the Clara Nevada and as the plot continues to unfold this spirited story will have armchair explorers and amateur detectives alike anxiously following every twist and turn as they are swept along through the history of the Klondike Gold Rush to a suspenseful final climatic chase across the rugged terrain of Canada's Yukon, the harsh land made famous in the stories and poems of such writers as Jack London, Robert Service and Pierre Berton. It is a riveting tale that brings to glorious life the landscape and history of Alaska's inside passage and Canada's Yukon, as Kitty is caught up in an epic mystery set against the backdrop of the scenery of the Klondike Gold Rush. 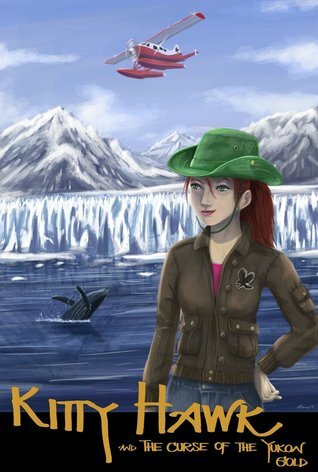 Kitty Hawk and the Curse of the Yukon Gold is a perfect book to fire the imagination of readers of all ages. Filled with fascinating and highly Google-able locations and history this book will inspire anyone to learn and experience more for themselves as Kitty prepares for her next adventure - flying around the world! This story was a whirlwind of mystery,adventure, sass and intrigue. I loved the fact that the book dealt with marine life and history in a way that you don't often see in Young Adult books. The writing was flowing and ample with a vivid description of the landscape , the right dash of thrill and original in its plot. The reader gets immersed in the story with Kitty Hawk along her journey on the quest for a family 's rightful possession . The book is a perfect read for you book club! I look forward to reading more from the author.